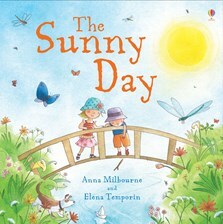 A beautiful picture book about the wonder of a summer's day, and all the things to discover. Follows two children on a sunny day as they run through a field of sunflowers, watch bees busy making honey and listen to crickets playing creaky tunes in the long, dry grass. The simple and engaging text is accompanied by the gorgeous illustrations of Elena Temporin. Available as ebook with narration (on tablets that support audio).